The KingCamp camping knife it can be easily open and closed. The blade of this stainless steel tactical folding knife is made of high carbon stainless steel and the handle is made of aluminum with titanium plating, which makes this knife really sharp and textured. The folding design can help you store the blade into its handle safely and save space. It can locks securely into place with liner lock. 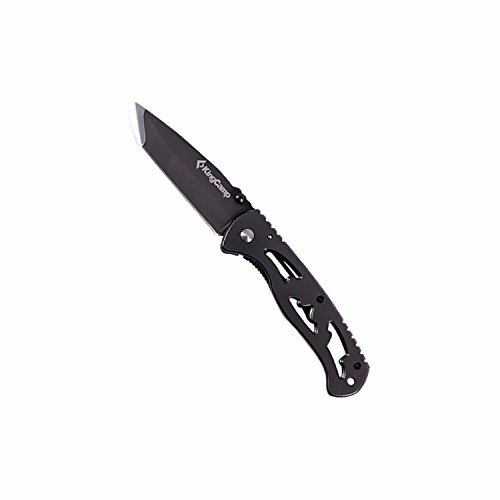 The knife comes complete with a pocket clip for easy and safe carry to avoid loss. The handle is hollowing-out which can greatly reduce the weight of its body and make it compact in structure to easy carry and use. The pocket knife with belt clip attaches your belt so well that you can get ready for anything at the campsite. KingCamp camping knife can prevent rusting when you do outdoor activities on rainy days. It is a gift for your loved ones. This knife is not belongs to the controlled knives, you can take it on the plane and the train. Not recommended for minors use. DURABLE AND FOLDING: The blade of this stainless steel tactical folding knife is made of high carbon stainless steel and the handle is made of aluminum with titanium plating, which makes this knife really sharp and textured. Durable enough to use for many years. PORTABLE WITH THE CLIP: With the compact design, you can put this knife into your pocket. It also comes complete with a pocket clip for easy and safe carry to avoid loss. The knife has frame lock for safe carry and storage.